Welcome to AFP South Eastern Ontario! 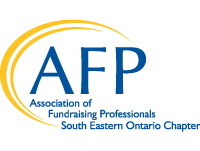 The Association of Fundraising Professionals South Eastern Ontario Chapter aims to support the highest standard of commitment, ethics, and professionalism within the fundraising profession. Our chapter is focused on providing members and friends, in the charitable and not-for-profit sectors, with opportunities to network, learn, and share knowledge and experiences. All chapters are members of and are supported by the Association of Fundraising Professionals (AFP). AFP advances philanthropy through its 33,000 members in more than 244 chapters throughout the world. AFP has inspired global change, has given credibility to our industry and has supported efforts that have generated over $1 trillion world-wide. AFP’s individual and organizational members raise over $115 billion annually, equivalent to one-third of all charitable giving in North America, and millions more around the world. Like many chapters, AFP South Eastern Ontario creates opportunities for continuing education and accreditation within the philanthropic sector. We offer monthly luncheons focused on specific areas of philanthropic interest, host a full-day annual conference showcasing the best of the best in our industry and celebrate individuals and organizations that have made a difference in our communities at our Annual National Philanthropy Day Awards event. Every year, AFP, the largest association of professional fundraisers in the world, honours chapters for achieving goals that align with key objectives in its long-range strategic plan. AFP South Eastern Ontario Chapter has received the Ten Star Award for performing specific activities designed to increase professionalism within fundraising and public awareness of the importance of philanthropy. Just one-third of all AFP chapters are named Ten Star Chapters, so we are proud to be among this select group. Our chapter serves communities between Brockville and Quinte West. This includes Kingston, Prince Edward County, Trenton, Napanee and all of the important communities in between. AFP SEO currently comprises over 60 members from large institutions, as well as medium and small organizations. If you are interested in learning more about AFP SEO and how you can become involved, please feel free to connect with us directly; or even better, join us at one of our personal development events. We would be more than happy to show you the value of becoming a member. Contact us at afpseo@gmail.com to learn more and get involved!